I am in love with cauliflower right now. I like it raw, I like it steamed, I like it turned into fake mashed potatoes and I love it in soup. The recipe below couldn’t be any simpler. It’s just a handful of clean ingredients most of which I usually have on hand. Speaking of which, if you don’t have one of the oils used, feel free to use just olive oil or just coconut oil. Just melt the coconut oil before drizzling it on the cauliflower. I often roast 2 heads of cauliflower when I roast a chicken and then use the bones to make chicken stock. I serve the chicken with half the veggies, setting the other half aside to make this soup the next day along with the chicken stock. Works like a charm. You can also play around with spices. This is a very basic soup. Add some fresh herbs to make it interesting, or stir in a can of coconut milk in the end and season with plenty of your favorite curry powder. Yum! 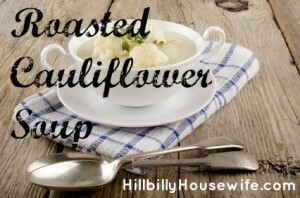 Coarsely chop the cauliflower and set it on a [url href=”http://www.amazon.com/gp/product/B000G0KJG4/ref=as_li_tl?ie=UTF8&camp=1789&creative=390957&creativeASIN=B000G0KJG4&linkCode=as2&tag=kinderinfocom-20&linkId=XT5HBTKBLGJ7UF2F” target=”_blank”]baking sheet[/url]. Drizzle with olive oil and sprinkle with salt. Back at 400F for 25 minutes or until your cauliflower is pretty soft. Chop the onion and cook it until it becomes translucent (about 10 minutes). Add the cauliflower and chicken stock and bring to a boil. Turn down the heat and simmer for 15 minutes or until everything is very soft. 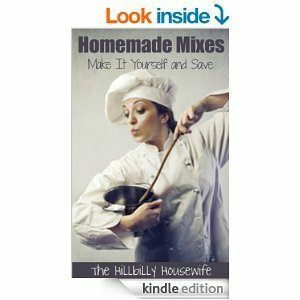 Blend the soup with an[url href=”http://www.amazon.com/gp/product/B00ARQVM5O/ref=as_li_tl?ie=UTF8&camp=1789&creative=390957&creativeASIN=B00ARQVM5O&linkCode=as2&tag=kinderinfocom-20&linkId=XVRJM2U4ZFB2S7AJ” target=”_blank”] immersion blender[/url] or in batches in your [url href=”http://www.amazon.com/gp/product/B00EI7DPI0/ref=as_li_tl?ie=UTF8&camp=1789&creative=390957&creativeASIN=B00EI7DPI0&linkCode=as2&tag=kinderinfocom-20&linkId=66I5YODLGKRBI2OI” target=”_blank”]kitchen blender[/url] until smooth.